At a certain stage of evolution, you have come to believe that you are something more than just a physical body. You begin to realize that in the world there are more things than the eyes meet. Most people direct their concentration on the things that are observable and tangible, but science proves that we feel the influence of the many things that are not visible to the human eye. If you have no idea how external forces can affect you, you can get to a general weakening of your own energy system. This weakness can manifest as actual physical illness or mental/emotional imbalances. Your energy system is attacked every day. Until we learn to recognize this phenomenon and to work in order to protect from unwanted influences, you may find that your life becomes more confused and bewildered. We have all experienced situations, where external forces have an impact on our energies. Very often we are influenced by the outside sounds, heat or electrical loads. Other people also invade our energies. Did someone ever make you feel inferior? Have you ever been pressured to buy something or to participate in any activity in which you actually do not want to get involved? Have you ever felt exhausted and “drained” after a conversation with someone? Each of these things is an interference in your energy field. In a strong and vibrant aura, exhausting and unbalanced energies are being diverted from it. Maintaining such an aura is not something difficult. Some of the most helpful practices to maintain a positive aura are discussed below. Proper diet, exercise, and clean air will strengthen the overall auric field. On the other hand lack of exercise, lack of fresh air, inadequate nutrition, addiction to alcohol, drugs, tobacco and other products wear and tear in the fibers of the aura. Furthermore, the aura is too heavily influenced by emotional and mental states – much more than people realize it. Prolonged stress, emotional trauma, mental imbalances and stress, abrupt changes, worries, fear and other negative emotions and attitudes weaken the auric field. The result of a weakened aura is the loss of energy. If this continues, in the fibers of your auric field can appear holes and tears. This will begin to manifest as physical health problems and other imbalances. Not strong enough aura has holes and dark areas in an unbalanced and weakened form. Recommended: How To Balance Your 7 Chakras System – Chakra Empowering. There are many easy ways to visualize and strengthening the human aura. Sunlight reinforces the auric field. It has the same effect as exercise. Clean air vitalizes the aura. Eating smaller amounts of food, but more frequent brings balance effect on the aura. Maintaining a clean intestine helps to preserve the aura strong and durable. 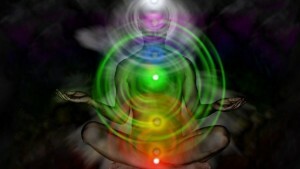 Meditation also acts as a protection to the aura. But you should not overdo these practices. The right measure in all things is the most useful thing in maintaining a vibrant aura. Music can also be used to balance and strengthen the auric field. Gregorian chants too acts against negative energies in the aura or in our environment. We’ve all experienced similar feelings when entering a room where people are quarreling. The air is thick. You can feel the tension. The sound of Gregorian music for about ten minutes in this room can purify it of all negative energies. It will do the same with aura. Some people have difficulty listening to Gregorian chants for various personal reasons or differences in tastes. If so, use some classical music that you think that acts as smoothing and refreshing. It can be anything – from the Haendle’s “Water Music” to Beethoven’s Symphony “Pastoral”. All of them are very nice choices indeed 😉 . Aromas purify and balance the auric field. A widespread aroma which acts as purifying and protecting the aura is incense, although because of its belonging to Christian tradition, many people do not use it. Generally incense has indeed a high energy vibration that may be very effective. For people who work in the field of treatment and social contacts, the scent of gardenia can be extremely effective. It helps not to engage too closely with the problems of others. 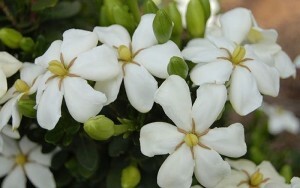 It helps to strengthen the aura, so to maintain emotional objectivity. 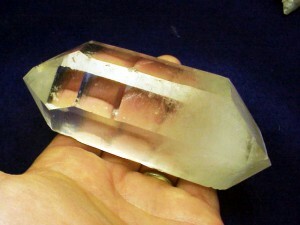 Another means of protecting and strengthening the aura is a quartz crystal or stone. The inherent crystal electricity will reinforce and strengthen the auric field. A good experiment to prove this is to get someone to measure aura when you are not holding the crystal in his hand, then your aura can be measured while holding in hand a crystal. Even a small crystal size 2-3 cm increases your auric field with 90-120 centimeters. Double-ended crystals (tapered at both ends) are extremely effective in strengthening the aura. Wearing similar crystal pocket can stabilize your aura. This is very useful when you know that you are going to be in distressing situations. This helps you avoid fatigue and tiredness. At the end of the day when you find that you are exhausted or just want to restore your energy levels, sit or stand straight with a double-ended quartz crystal in both hands. Relax and visualize how the energy of the crystal recharges your body and fills your auric field energy. To help it carry your rhythmic breathing. Five or ten minutes will be all you need to balance and enhance energy. This helps you to alter the position and attitude of mind and direct it towards a more relaxed and peaceful state. This allows you to leave behind your problems because this procedure purifies aura from negative energy deposit that you brought with you from your workplace. The stronger and vibrant you maintain your aura, the less will be the likelihood of interference in your energies. If you care about the aura of your family and friends please share this article with them!